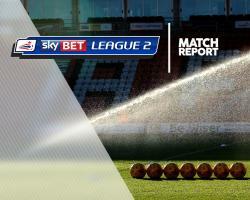 Doncaster's Sky Bet League Two title hopes suffered a blow as they slipped to a 2-1 defeat at play-off hopefuls Wycombe. Rovers were looking to extend their advantage at the top of the table, but fell behind after just nine minutes through a Luke O'Nien header. They equalised just nine minutes later, with Alfie May seeing his deflected cross loop over the head of goalkeeper Jamal Blackman. But Wycombe regained the lead in the 32nd minute, with O'Nien grabbing his second as he fired a volley past Ian Lawlor after an excellent cross from Joe Jacobson. Rovers tried to hit back again in the second half but John Marquis and Mathieu Baudry were unable to add the finishing touch. The hosts could have wrapped up the game with three minutes to go as Dominic Gape rattled a volley against the crossbar. But Wycombe held on - despite late pressure from Rovers - to clinch all three points and they now sit one point off the play-off places.